I am not much of a seminarist. I find the the academic pretensions a trifle too irritating and I am particularly wary of those that deal with the problems of today as if history and the past have had no role in creating the problems and feel that in the study of International Relations, the academic discipline of History must play a vital role. There are two reasons for saying this: India does not have an indigenous tradition of Historiography and therefore has no tradition of diplomacy and statecraft. The last theory of statecraft that emanated from India was Kautilya's Mandala Theory of Kingship and Statecraft which goes back to the Mauryan perid. Unlike the great civilization of China, India did not practice the craft of writing History. The second reason is more practical. India got its political freedom in 1947 when three great empires disintegrated" the British Empire, the Japanese co prosperity sphere and the the French Empire. The disintegration of these large imperial entities was accompanied by the rise of two ideologically antagonistic empires: the American and the Soviet empires. USA was able to co-opt the defeated Europeans into a NATO military alliance and the Soviets created the Warsaw Pact as a counterbalance. In a discussion on the emerging challenges before the India in the 21st Century, particularly with regard to its relationship with USA, the only world hegemon in the contemporary scenario, I expect these historical trends to be debated so that we understand the historical context of India;s diplomacy vis a vis USA. I do not want to use the word Statecraft because there is no long term planning or goals in the conduct of Indian foreign policy. In a International Seminar in a University situated in Pondicherry these perspectives were raised only by me, a historian and not a "political scientist". 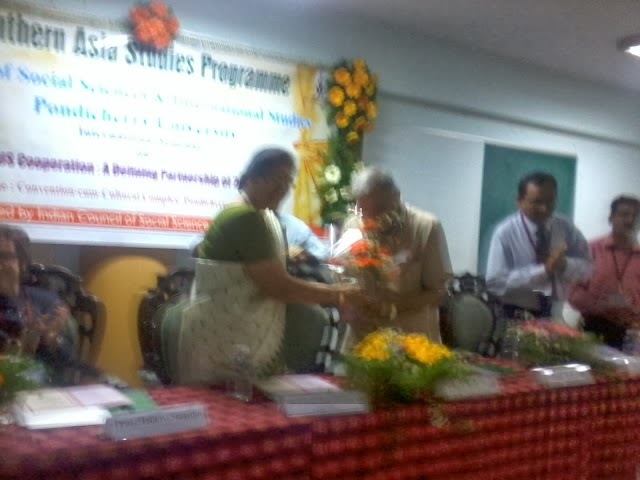 The Seminar was inaugurated by the Vice Chancellor of Pondicherry University Dr. Chandra Krishnamurthy who in her Presidential Address dealt with the major themes of the Seminar. The former Vice Chancellor of the University dr V T Patil gave a sound overview of the challenges facing India and went on to add rather gratuitously that China will be a major threat to India. This hostility toward China which is the signature of the India political and academic community is what I would like to challenge. 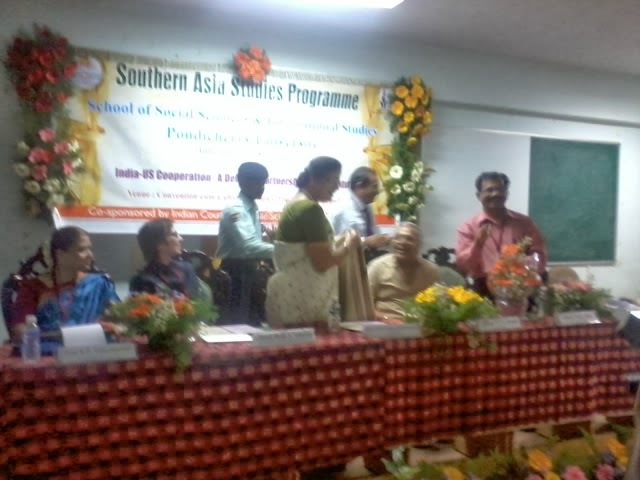 Almost all the speakers including Professor Vijayalakshmi from JNU maintained that China is a major threat to India. This kind of ideological framing of an important issue before the Nation without an iota of critical application of mind does enormous damage to Indian foreign policy with regard to China with which India has had 2,000 years of peaceful coexistence. I met mr D S Rajan a China expert who seemed more forthright on China said that the shadow of 1962 has not lifted. The Indian foreign policy experts play up the threat from China in order to justify India;s deadly embrace of the strategic vision of USA which wants to use India as cannon fodder against China. The Seminar was organized by Professor N K Jha and his colleagues in the Department of Politics and International Studies. My observation which I made repeatedly was that China is not a threat to India and USA will not abandon its special relationship with Pakistan in order to build better ties with India. Nobody even mentioned that USA did not allow access to the American terrorist David Coleman Headley who was one of the masterminds of the 26/11/2008 massacre in Mumbai. As George Santayana said those who forget History are condemned to relive it.